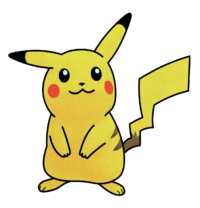 Pikachu is an Electric-type Pokémon and is the mascot of the popular Pokémon series, made by Game Freak. Pikachu has made some video game appearances alongside Mario, most notably in the Super Smash Bros. series. In the Pokémon series, Pikachu is the evolved form of Pichu and evolves into Raichu. Pikachu has been voiced by Ikue Ohtani in the Super Smash Bros. series. She also voices Pikachu in the Pokémon anime, Pokémon Yellow Version: Special Pikachu Edition, since Generation VI games, and various spin-offs. 2.1 Profile information from Super Smash Bros.
A Poké Ball is thrown, and Pikachu appears from it. Pikachu is a default playable character in all five released games of the Super Smash Bros. series. 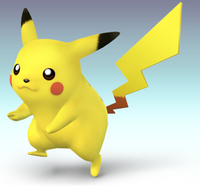 Pikachu's artwork from Super Smash Bros.
Pikachu appears as a default character in Super Smash Bros. Pikachu is one of the game's faster characters in both running and walking speed, but is also among the lightest, meaning that while it can move quickly it can also be KO'd earlier than other characters. Its standard special move is Thunder Jolt, which sends out a ball of electricity that travels along the ground and causes opponents to flinch. Its up special move is Quick Attack, which allows it to move with two sudden bursts of speed. Its down special move is Thunder, which sends down a bolt of lightning from the top of the stage to strike opponents. Pikachu returns in Super Smash Bros. Melee, yet again as a default player. Pikachu's moveset is mostly unchanged from the previous game, though it now has a side special move, Skull Bash, which allows Pikachu to launch itself across the screen and headbutt opponents. In addition, its down special Thunder now appears from a cloud instead of the top of the screen. Pikachu's down smash is now a multi-hitting, electrical spin; additionally, its back throw from the previous game has been moved to its forward throw, though it is much weaker than before. Pikachu's pre-evolution Pichu also appears as a playable character in this game, with a moveset similar to Pikachu's. In addition, one of Pikachu's alternate costumes in this game is the hat of Red as he appears in the original Pokémon Red and Blue Versions. Pikachu was one of the first characters revealed for Super Smash Bros. Brawl. Its moveset remains entirely unchanged, and its Final Smash is Volt Tackle, which causes Pikachu to become a ball of electricity that players can maneuver across the entire screen, damaging any opponents it runs in to. 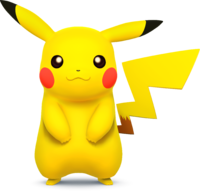 While Pikachu keeps most of its alternate costumes for this game, its blue alternate costume, the party hat, has been replaced with a pair of goggles, similar to the ones worn by Pichu as one of its alternate costumes. Pikachu begins the game trapped within a strange device that harnesses its electrical energy to provide power to the complex. Samus, infiltrating the complex in search of her Power Suit, sees that the device causes Pikachu pain, and breaks it. In thanks, Pikachu helps Samus continue through the lab. Eventually, the pair come across Samus's Power Suit within a tank. After dispatching two clones of Samus, Pikachu helps Samus (in her newly regained Power Suit) through the rest of the facility and helps her defeat Ridley. After escaping from the complex, Pikachu and Samus infiltrate the Subspace Bomb Factory and encounter the Ancient Minister. Despite Donkey Kong, Diddy Kong, Captain Falcon, and Captain Olimar coming in soon after, the Ancient Minister does not fight back, and tries to stop the other R.O.B.s from obeying Ganondorf. Ganondorf gets the R.O.B.s to set up multiple Subspace Bombs, and the Ancient Minister, with the R.O.B.s no longer under his control, reveals himself to be the head R.O.B. of the island and helps Pikachu and the others defeat the Subspace Army and escape the island in the Falcon Flyer before it is consumed by Subspace. Pikachu and the rest of its team join the remaining heroes in their last stand against Subspace, only to be defeated by Tabuu. Fortunately, King Dedede had planned this in advance and created badges that revived fighters from being trophies. Using these, he is able to form a team consisting of himself, Luigi, and Ness. Dedede and his group then revived most of the others, including Pikachu, before everyone has rejoined and proceeded to face Tabuu in a final battle. 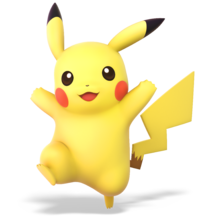 Pikachu is once again a playable character in Super Smash Bros. for Nintendo 3DS and Super Smash Bros. for Wii U, its moveset once again unchaged from its previous appearances. 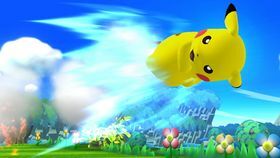 Pikachu's Thunder move, which still summons a cloud, now acts as a meteor smash, which can do further damage to opponents. In addition to its alternate costumes in Super Smash Bros. Brawl, two of its new alternate costumes are the hats of Ethan and Calem, the male trainers in Pokémon Gold and Silver Versions and Pokémon X and Y, respectively. Pikachu returns as a playable fighter in Super Smash Bros. Ultimate. Pikachu's Final Smash has it travel across the screen at a much faster speed than before, though the move needs to connect with another fighter in order to continue, and missing can lead to a self-destruct. It also has two new alternate costumes, one that swaps it out for the female Pikachu Libre and another where it wears Selene's cap from Pokémon Sun and Pokémon Moon. Pikachu has various alterations to its moves and now appears angry during many attacks. Some of Pikachu's standard attacks receive names: its standard attack is Headbutt, its dash attack is Running Headbutt, its down smash is Electric Flower, its back aerial is Glider, and its down aerial is Electric Skew. By completing Pikachu's Classic Mode route, it is possible to unlock Villager, Shulk, R.O.B., Mega Man, Isabelle, Mr. Game & Watch, or Pichu. Pikachu's Classic Mode route has it facing off against other Pokémon. The route's name, "I Choose You! ", is a common phrase throughout the Pokémon franchise (for example, it is used in the title of the first episode of the Pokémon anime). Incineroar Pokémon Stadium The Battle at the Summit! Thunder Jolt is Pikachu's standard special move, which it shares with Pichu. This move is notable for not having a counterpart from the Pokémon games. When used, Pikachu launches a ball of electricity rotating across the stage until it collides with an opponent. The attack can travel off the sides of the stage, as well as along walls if they are not too steep, but not along the underside of fall-through platforms. When the attack is used in the air, it begins as a larger, more powerful ball of electricity until it hits the ground. 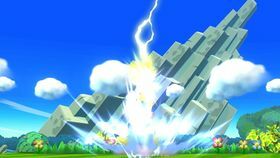 In Super Smash Bros. for Nintendo 3DS and Super Smash Bros. for Wii U, Thunder Jolt's first custom variant is Thunder Wave, an Electric-type move from Pokémon, which like its namesake sends out a ball of electricity that deals less damage and does not travel as far but paralyzes opponents when it hits. 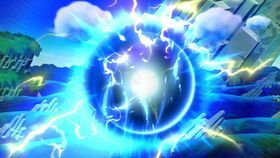 The second variant is Thunder Shock, another Electric-type move, which sends out a ball of electricity that travels directly ahead; although it does not travel as far and is weaker if it hits closer to Pikachu, but hits with a more powerful blast of electricity if it hits from farther away. Skull Bash is Pikachu's side special move in the series starting with Super Smash Bros. Melee, shared with Pichu. The attack is based upon the Normal-type move from the Pokémon series. When used, Pikachu charges up an attack before flying across the screen to attack opponents with a headbutt. The move can be charged by holding down the special move button, which increases the range and power of the move. 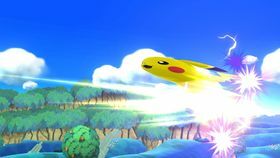 In Super Smash Bros. Melee, the attack leaves Pikachu helpless if it does not land back on the stage after use, but this no longer occurs as of Super Smash Bros. Brawl. The move also takes less time to charge in the later games. In Super Smash Bros. for Nintendo 3DS and Super Smash Bros. for Wii U, Skull Bash's first custom variant is Shocking Skull Bash, which deals multiple electric hits, the final hit dealing greater damage and knockback. The second variant is Heavy Skull Bash, which does not travel as far but charges and travels faster, and deals more damage at the start of the attack. Quick Attack is Pikachu's up special move based on the Normal-type move from the Pokémon series. Pikachu quickly moves into the air in a burst of speed the direction that the player is holding on the control stick. If the player changes the direction they are holding mid-attack, then Pikachu receives a second burst of speed in that direction. In Super Smash Bros., this move does not inflict any damage, but it does in every later installment. In Super Smash Bros. Melee, Pichu has a variant of this move called Agility. In Super Smash Bros. for Nintendo 3DS and Super Smash Bros. for Wii U, Quick Attack's first custom variant is Meteor Quick Attack, which moves and acts slower and does not travel as far but has a meteor effect during the beginning and when changing directions. The second variant is Quick Feet, which only gives Pikachu one burst of movement that travels farther. Thunder is Pikachu's, as well as Pichu's, down special move, based on the Electric-type move in the Pokémon series. Pikachu calls down a bolt of lightning that strikes any opponents in its path to damage them. If the bolt strikes Pikachu, any nearby opponents are damaged by this as well. In Super Smash Bros., the lightning falls from the top of the screen, but in Super Smash Bros. Melee, a cloud appears above the player at a fixed height relative to their position. In addition, in Super Smash Bros. Brawl onward, the move sends Pikachu into the air if it strikes Pikachu while in midair, and in Super Smash Bros. for Nintendo 3DS / Wii U, the move can meteor smash at a certain point in addition to the shockwave being able to now damage opponents. In Super Smash Bros. for Nintendo 3DS and Super Smash Bros. for Wii U, Thunder's first custom variant is Thunder Burst, which instead of bringing down a bolt of lightning causes Pikachu to discharge electricity from itself to damage opponents for multiple hits. The second variant is Distant Thunder, which causes the cloud to appear at a higher distance, increasing the duration of the move and dealing more damage closer to the cloud. Volt Tackle is the signature move of Pikachu's evolutionary line in the Pokémon series since Generation III, and appears as Pikachu's Final Smash. 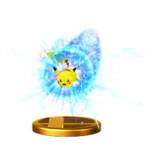 Pikachu turns into a large ball of electricity, able to fly around the stage freely and damage opponents Pikachu flies into. The player can press the attack button to discharge electricity, dealing greater damage and knockback. After discharging, the player has to wait a second for the move to recharge. Once Volt Tackle is about to end, Pikachu will begin to slow down and movement will be slightly restricted. Additionally, Pikachu cannot fly past the blast lines in this form. In Super Smash Bros. for Nintendo 3DS / Wii U, a ball of light appears alongside Pikachu that follows the direction the player is holding, serving as a guide, though the this ball deals no damage to opponents. In Super Smash Bros. 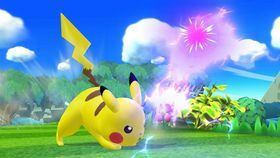 Ultimate, Volt Tackle is now automatically controlled, as Pikachu flies rapidly across the screen multiple times before finishing with a burst of electricity that launches opponents away. Pikachu appears as a Costume Mario costume in Super Mario Maker, obtainable by collecting a Mystery Mushroom. The Pikachu costume is unlocked after the player either scans a Pikachu amiibo or completes the 100 Mario Challenge on Normal difficulty or higher. Profile information from Super Smash Bros. When several of these Pokémon gather, their electricity could cause lightning storms. DS Pokémon Diamond/Pearl A Mouse Pokémon. Its lightning-bolt tail and round cheeks are its trademarks. When danger draws near, it uses tiny electric pouches within its cheeks to discharge electricity. When it's really fired up, it unleashes thunderbolts on its rivals. It's said to recharge when it's sleeping. It evolves into Raichu. Wii Super Smash Bros. Brawl Pikachu, transformed into a ball of light that can slam into foes. It can also fly to chase down those who try to jump out of range. Sparks get stronger when you press the attack button. However, its increased inertia makes midair movement tough. If you get carried away flying, the effect will end, and you'll destroy yourself. Be careful it doesn't happen to you. Mei Ling: (overjoyed) Ooh, how cuute! Snake: What? The yellow thing? Mei Ling: That's Pikachu. It's a Pokémon. They're popular all over the world, you know. And it may look cute, but be careful, It can store up large amounts of electricity in those adorable little cheeks. It'll try to pepper you with electric shocks. Mei Ling: Oh, and, Snake? Mei Ling: I was wondering, could you maybe try and catch Pikachu for me? Pleeeeease? Snake: Give me a break! What do I look like, a Pokémon Trainer? Mei Ling: Fine... Sorry I asked. GB Pokémon Yellow: Special Pikachu Edition (10/1999) Recognized the world over, Pikachu is an Electric-type Pokémon that stores energy in its cheeks for use in battle. In Smash Bros., Pikachu is a well-rounded fighter with speedy, powerful electric attacks. Quick Attack can be used twice in a row if two directions are input, one after another. Pikachu is famous worldwide as the face of the Pokémon series. There's a lot of electricity stored in those rosy cheeks, and in this game, that allows for some devastating attacks, like Thunder Jolt. Tip: Input another direction after using Quick Attack to get a second burst. It's top-notch for recoveries! GB Pokémon Yellow: Special Pikachu Edition (10/1999) Pikachu's Thunder Jolt fires off a ball of electricity that bounces across the stage, getting weaker as it travels. It does more damage to enemies in the air. The default down special, Thunder, causes a lightning strike that both shocks opponents and turns Pikachu invincible for a split second. Pikachu's Thunder Jolt fires off a ball of electricity that bounces across the stage, getting weaker as it travels. Airborne enemies will take extra damage from it and get launched further. The default down special, Thunder, causes a lightning strike that both shocks opponents and turns Pikachu invincible for a split second. N/A Pikachu's Final Smash turns its whole body into a powerful ball of electricity that darts around at high speed, tackling opponents. While Pikachu is charging around, press the attack button to unleash powerful sparks. There's also a little ball of light that flies ahead of Pikachu itself. Use that as a guide if Pikachu seems out of control! For Pikachu's Final Smash, it surrounds itself with a ball of electricity and darts around at high speed, tackling opponents. While it's charging around, press the attack button to unleash powerful sparks. You can also use little ball of light that flies ahead of Pikachu as a guide if it seems out of control! Viridi: Aw, look at that cute little guy. Palutena: And not just any Pokémon! Viridi: Actually, that Pokémon is called a Pikachu. Pikachu evolves from Pichu. And when a Pikachu is fully evolved, it becomes a Raichu. Palutena: It's quite rare for a Pokémon to be more famous in its middle stage than its final evolution. Viridi: True, but Pikachu is a special case. I mean, it's the most famous of all the Pokémon. Pit: Uh, excuse me! Hello? Palutena: What is it, Pit? Pit: I hate to interrupt your musings on Pokémon, but I could really use some Smash Bros. help right about now! Palutena: Oh, right. I forgot where we were. OK, here's a tip: dodge Pikachu's Thunder, and then counterattack. Viridi: You can also zap Pikachu by reflecting its Thunder back at itself! And nothing is more satisfying than that! Pikachu is the only playable Pokémon in the Super Smash Bros. series to have a gender difference. Female Pikachu have a heart-shaped dent at the end of their tail, while the Pikachu in Smash does not, which may indicate that the Pikachu in Smash is male. However, this distinction was first apparent in Generation IV of the Pokémon games. Pikachu is the only character in Brawl to have only four palette swaps. A "Mario Pikachu" merchandise promotion was announced for Japan featuring Pikachu dressed as Mario and Luigi. Official artwork also features other Pokémon standing in for Mario characters, such as Diancie for Princess Peach and Blastoise for Bowser. This page was last edited on March 30, 2019, at 21:37.